"We are recommending you guys to all of our prepping friends here in Utah. Your ethics and values should be more common among business in todays society. We wish your company the best success and thanks again for your great customer service." "I just wanted to say that I think your product is amazing." "Your site is really one of the better designed sites out there. It is easy to navigate and just pleasing to be on." "Thank you very much. You are one of the old breed and give help when people ask for it, I will be in debt to you." Save Seeds from this year to plant next year... FOREVER! Plant 2+ acres preparedness garden TODAY! 5.9LB of seeds in water/air-tight Vault. More survival seeds for your money. 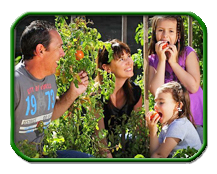 Feed your family and friends this year and into the future with 100% NON HYBRID (Open Pollinated) Seeds. You MUST use non-hybrid seeds in order to save seeds from your crops for future planting. 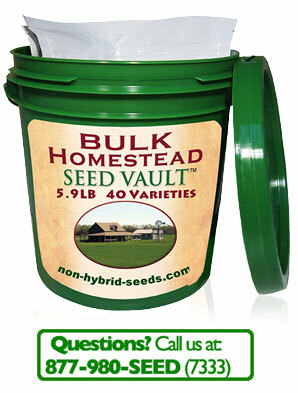 The Bulk Homestead Seed Vault™ is moisture-reduced for long term storage according to USDA developed methods. Twice the shelf life of other "patriot" seeds. The Bulk Homestead Seed Vault™ and other Seed Packs from Heirloom Organics are prepared for long term storage, stored in resealable pails and shipped within 2 days of your order. Long Term Storage Processed (USDA Method). 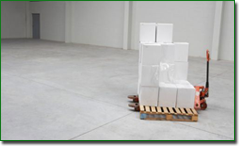 We use a specific 4 hour process for reducing moisture prior to sealing. This USDA-developed preperation method doubles the storage life of most seed varieties. Our seed experts focus on varieties like leafy greens, for example, because of short growing cycle, rather than tomatoes which require a very long growing period. Sealed against moisture with inner 6mil bags and resealable pails. Open, inspect the contents, plant some this year and store the rest. You can even bury it, if you choose. 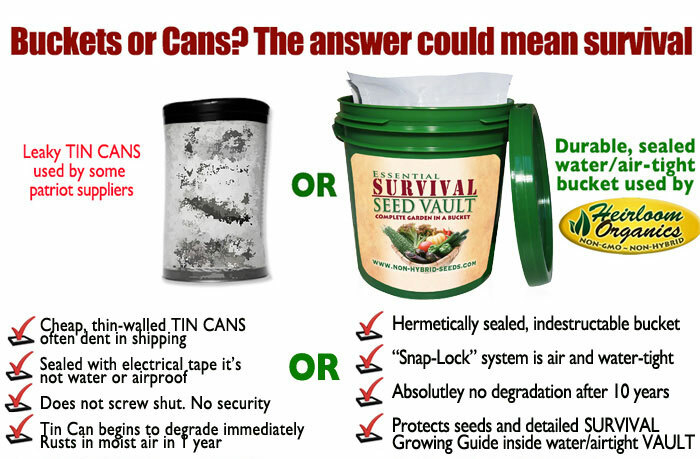 The Bulk Homestead Seed Vault™ is 100% moisture proof. 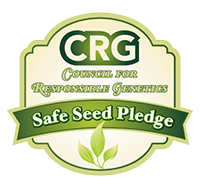 We are a seed company, EXCLUSIVELY. We distribute nothing but seeds; Non-Hybrid (Open Pollinated) seeds. 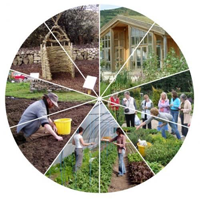 Our focus allows us to provide the best selection of seed varieties for nutrition and garden layout, the best quality and price of seeds possible, direct to you. State-LICENSED seed distributor. As a licensed seed dealer, Heirloom Organics has the skill and knowledge to select the RIGHT varieties for your survival garden. Largest Growing Guide on the internet. 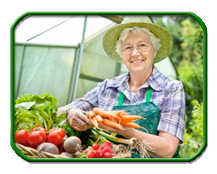 Because Heirloom Organics has 30 years experience in Organic Gardening and is a seed specialist, we provide you with the largest, searchable growing guide in the world! FREE! It's online and everyone has access to it. This seed pack is processed for long term storage according to the US Dept. 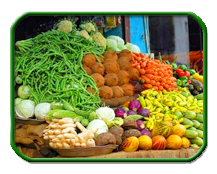 of Agriculture (USDA) methods for maximum shelf life, increasing the shelf-life of our seeds by many years. 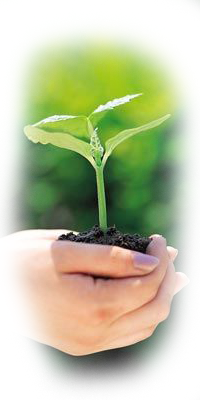 Heirloom Organics is the only supplier of seeds that has studied and implemented these methods developed by the USDA. No other seeds available today incorporate these advanced methods for seed packaging and storage. The Bulk Homestead Seed Vault™ is truly the food source of tomorrow, packaged with advanced storage methods today. Each Bulk Homestead Seed Vault™ has a total of 40 varieties of NON-HYBRID seeds. Also included are detailed online growing instructions for each variety which includes helpful information on harvesting of seed stock for the following year in a survival situation. Among the earliest crops in spring, plantings of this hardy perennial can last for decades if well cared for. Barley is a common sweet grain with loads of health benefits and a variety of purposes. 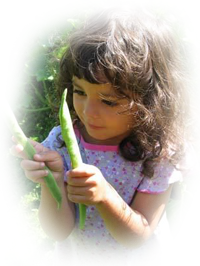 As the designation implies, bush beans grow in a more compact manner than pole beans, and do not climb. Lima beans are native to Peru, where they have been cultivated for thousands of years. Unlike bush beans, pole beans require additional support for proper growth. boiling or sautéing and fresh greens to boil or steam. heads. It contains high levels of antioxidants. miniature cabbages and form where the leaves meet the stems. raw or cooked. Grows well into winter & stores well. member of the muskmelon family was prized by ancient Egyptians 1000s of years ago. Carrot is a hardy, cool-season biennial that is grown for the thickened root it produces in its first growing season. The ribs of celery are crunchy and are often used to make soup or salad. It has a salty taste. Collard greens are highly nutritious staple green "cabbage-like leaves" vegetable. It's not hard to grow great-tasting corn, and you won't get it any fresher. Whether for pickling or slicing, cucumbers are easy to grow if you give them good soil, full sun and sufficient moisture. With their often large & purple or white blooms eggplants are ornamental enough to grow in the front yard! plants can be eaten raw, or cooked for soup & stir fries. grow, highly nutritious and versatile lettuce available. Bibb is an excellent source of necessary iron and vitamins E and C. Grows on window sills year-round. A favorite in Ceasar Salads. Fast growing. Eat as baby or full grown. Very nutritious. Excellent for fibre, minerals and vitamins B, B2 and C. Cultivated for over 5000 yrs! A staple of any survival garden. is easy to grow and use. during spring & early summer. Despite the name, they are more similar to beans than peas. The standard bell pepper for many decades is still the largest open-pollinated, heirloom bell you can grow. Rye is a grass grown extensively as a grain, a cover crop and as a forage crop. greens ready to harvest, but it's quick to turn bitter. it widely available & popular with home gardeners. is still cool. The flavor is improved by light frost. as a staple is second only to rice. rind. Taste great in salads. You will notice that we are VERY PARTICULAR in our cholce and counts of varieties. We provide a LOT of leafy greens (over 1 acre) because these varieties allow you to begin harvesting and eating within 20 days of planting. Absolutely necessary for a survival garden. So, for example, if you had a “survival” seed pack made mostly of tomatoes, this could be disastrous since tomatoes take the longest of any vegetable to produce food (months). Our seed specialists choose your varieties with planning and experience, so you can rest assured your family will be cared for. *Important: We are in a very real non-hybrid seed shortage. 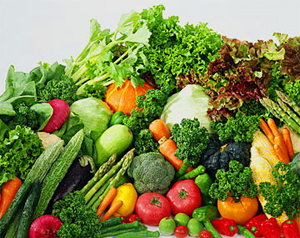 Carrots and cucumbers are becoming scarce as you read this and many vegetables will follow by mid to late Spring. 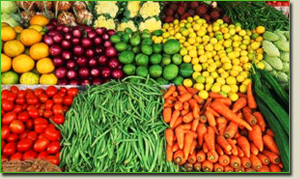 If the economy worsens, one of the first things to be affected will be our country’s food supply. causing soaring prices and severe shortages. Without the ability to grow your own food next year, your family may be in danger. 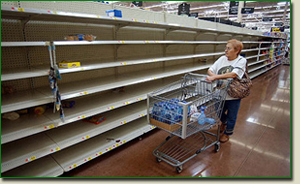 The food distribution supply system is only 3 days, which WOULD LEAVE STORE SHELVES EMPTY in the event of a supply crisis. 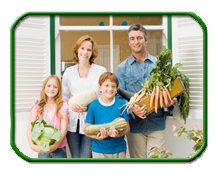 Can You Take Charge Of Your Family’s Food Supply? First, you need to know that if things were to get bad your family will still eat. You have enough non-hybrid seeds to plant more than 2 acres. This could mean the difference between thriving and starving. Think about it…your family. Thriving because you have the Bulk Homestead Seed Vault™ of Non-Hybrid Seeds. 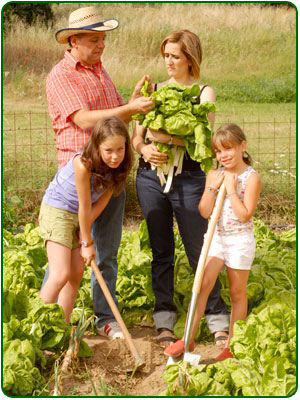 With our Bulk Homestead Seed Vault™, (trusted since 1997) growing your own survival garden becomes easy. Be assured, our seeds are not hybrid or genetically modified. You save your harvest seeds from this year and have more than enough to plant next year. You never have to buy seeds again! Not possible with hybrid or GM (genetically modified) seeds. Non-hybrid seeds are becoming scarce as you read this. Prices have already gone up on cucumbers and carrots, with shortages nationwide. This Seed Vault WILL run out. Buy the Bulk Homestead Seed Vault™ now to ensure you get the MOST seed for your money. Once general shortages hit we will need to reduce the amount of seed we can supply with each vault. Repeat, you will get the most seed for your money when you buy your Vault now. $249 Until We Run Out! So… all in all… you're saving $111.00 off the full price… and you get access to our extensive online growing guide FREE. Order now to ensure you receive yours! P.S. One last thing — I want to make SURE you understand how much you’re getting here. If you purchased these same seeds “retail” you could very well pay hundreds of dollars. 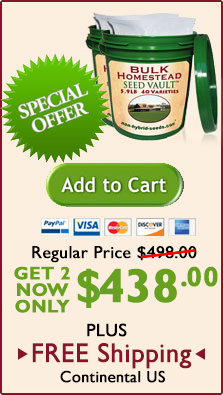 That makes the Bulk Homestead Seed Vault™ package a ridiculous bargain. 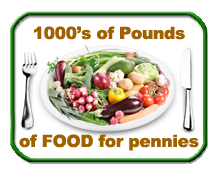 For just $249.00 plus shipping, you get enough seeds to plant more than 2 acres survival garden! And… you’ll have confidence knowing that you and your family will be able to eat if the economic downturn continues to worsen. You’ll have the best germinating seeds available. Don’t wait another second — order online right now, while you’re thinking about it. P.P.S. 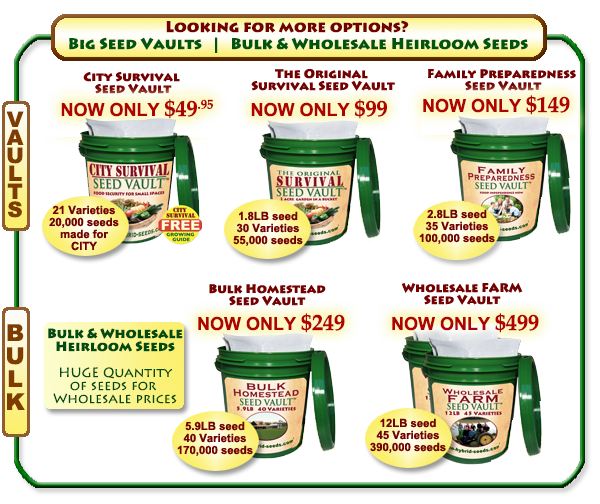 Remember… when these Bulk Homestead Seed Vaults™ are gone, with the current seed shortage, we can’t guarantee enough non-hybrid seeds will be available to meet the current high demand.